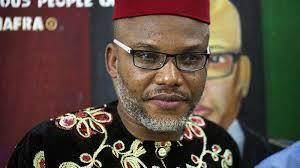 The family of the leader of the proscribed Indigenous People of Biafra, Mr. Nnamdi Kanu, has petitioned the United Nations, the European Union and other foreign countries, accusing the Nigerian Army of looting valuables from their son’s home during a raid on October 8. Mr. Ifeanyi Ejiofor, who is well known as Kanu’s personal lawyer, signed the petition on behalf of the traditional head of Afaraukwu Ibeku, Umuahia, in Abia State, and Kanu’s father, Eze Isreal Okwu-Kanu. The Army had claimed that lethal weapons were recovered from the house. But it was alleged in the separate letters sent by Ejiofor to the international bodies and foreign countries that “CCTV footage” attached to the said letters “picked” the alleged looting by a combined team of soldiers and policemen. The said CCTV recordings were not made available to our correspondent. The letters read in part, “We are solicitors to the family of His Royal Majesty, Eze Isreal Okwu-Kanu, hereinafter referred to as ‘our client’ and on whose standing instruction we file this communication with the British Government. “It is our brief, that on the 8th day of October, 2017, our client’s son’s home (Nnamdi Kanu) in Afaraukwu Ibeku, Umuahia, in Abia State was invaded, and violently looted by rampaging Nigerian soldiers and their police counterparts. The separate letters were addressed to the Resident Representatives of UN and EU, the US Ambassador, the Russian Ambassador to Nigeria, the High Commissioner of the British High Commission; and the High Commissioner, the Canadian High Commission. The letter added that the IPOB leader might have been killed during the military operation. It added that the raid on October 8 lacked any legal backing as there were many pending suits challenging the earlier invasion by soldiers and another challenging the court order proscribing IPOB. The letter read in part, “The raid and consequent looting in the home of our client’s son, (a British citizen) by the soldiers and their police counterparts does not enjoy the protection, backing, and legitimacy of any known legislative enactment in Nigeria. The family urged the foreign governments to treat the proscription of IPOB with circumspect, adding that the legality or otherwise of it was already being challenged in court. The Director, Army Public Relations, Brig Gen. Sani Usman, could not be reached for comments as his mobile rang out. He had yet to reply to a text sent to him as of the time of filing this report. Usman had, during a briefing last Thursday, insisted that the army did not raid Kanu’s house as alleged. The deputy Director, and 81 division Spokesman, Colonel Sagir Musa, also was not available for comment as of press time.